Store your Mojo in a cool dry place when not in use. Mojo Working As We Speak. 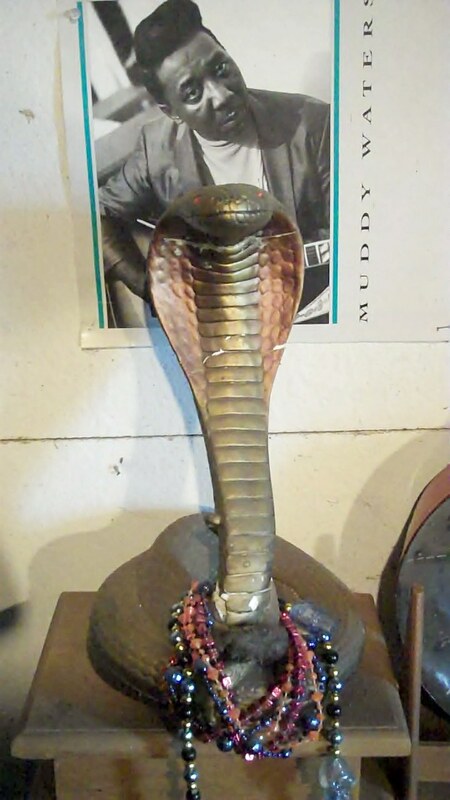 I developed such an obsession for Muddy Waters and his music, that when I saw a picture of Muddy’s dressing room and the plaster cobra with sparkly glass eyes he kept on the counter, I went out and bought one just like it. The photo was inside the album cover for “Electric Mud”, an attempt to boost Muddy’s sales by “psychedelicizing” his sound with inappropriate guitar distortion and effects. The album cover was the best thing about it. 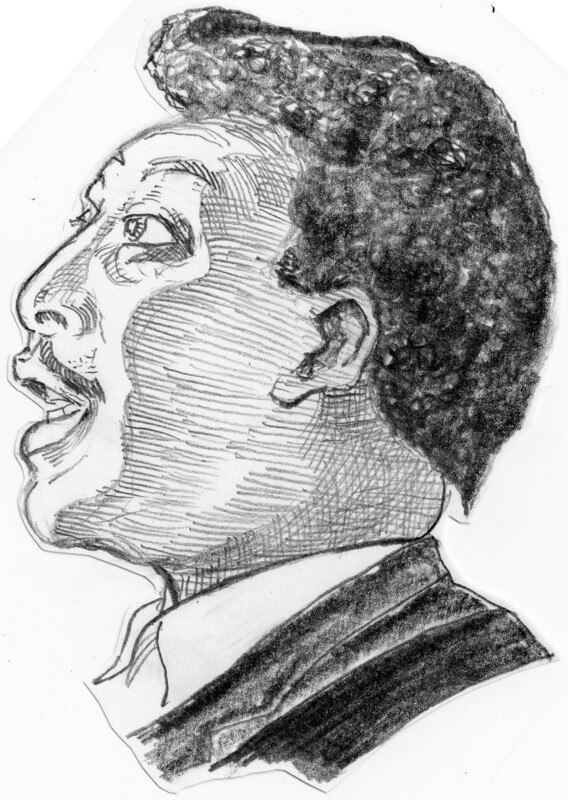 When I was at The University of the South (Sewanee), I was a member of the Jazz/Blues Society. We put on student concerts and one of them featured Muddy (when James Cotton was playing harp); I think it must have been 1965. Before the concert we had a little cocktail party for Muddy and the band at one of the fraternity houses. Muddy sat down at the piano in the common room and rambled into “Goin’ Down Slow”. Having exceeded my recommended dosage of everything available, I easily and aptly accompanied him on air harmonica, or so I thought at the time. Maybe they were laughing at me, not with me, but I was in fanboy nirvana, with a Jack Daniels chaser, so I should care? I included him this month because when he had his mojo maxed out he could be pretty scary. The photo shows my Muddy Shrine currently in The Shed. Yes, that is my 40+ year old plaster cobra. I’m so old now that even the coaches, hell the general managers of NFL teams look young to me; the players look like big steroid babies. But back in the day, for the briefest glimmer of time geologically speaking, I was a football player. A 215 pound tackle, to be precise. In those days the platoon system was in its early experimental stages, most tackles were still expected to play both offense and defense. In the 8th grade a perceptive coach recognized my potential for violence and precocious bulk. He recruited me to a championship Jr. High football team, undefeated that year. I continued on through high school, earning a varsity letter for four consecutive years. But I was starting to see larger and larger guys lining up across from me even then. I began to suspect that it might take a little more meanness and conviction than I was able to bring to the table, to succeed at the next level. But my high school football resume did enable me to get into a quality university, with a partial scholarship and a student loan (that took me twenty years to pay back). The school did not subsidize athletics but my high school grades were good enough that with a little inside pull ( my high school coach knew the head coach at Sewanee, Shirley Majors, and put in a good word for me) I was a Freshman at The University of the South in Sewanee, Tennesse. But by the time I reached college I was already beginning to dread two a day practice sessions to the point where I was considering maiming myself to avoid them. Those daily double-dips of pushing myself to the limits of my endurance of pain, the physical and mental assault on my delicate sensitivities, began to cramp my style. In the words of Ferdinand the Bull, “I just want to sit under my favorite tree and smell the flowers.” And apparently everything I’d learned about football before was wrong. As the days progressed I recognized that I was destined to fulfill the role of tackling dummy, at best, on this team. Since my scholarship was not contingent on my participation in sports, I chose to exercise my option to boogie. So that brings us to Those Amazing Humans, # 30, Shirley Majors. During that one painful year of discovery that I didn’t have what it takes to be a football player at the college level, he was my football coach. I also do not have what it takes to write my true feelings about this gentleman. I will have to simply provide an anecdote which illustrates the “strength of his convictions”. I did not sign up for the Pre-season Football Camp the following year, and let it be known that I intended to devote more time to my studies (of beer and girls and rock and roll). A month or two later as I was walking to my next class, I passed Coach Majors and a couple of team stalwarts in conversation. I must have been close or he was a champion spitter, because he came within inches of coating my “Bass Weejuns” (the loafer du jour) with Bull Durham. As he wiped the tobacco/saliva residue from his lips, I could hear him mutter, “Quitter!” You can’t argue with that kind of motivational skill. So I motivated on out of there. He must have been a good coach, though. The year after I quit, the team had an undefeated season. That was no coincidence. I was becoming a cancer on the team. I had to quit.During his stint as head coach he had an excellent win-loss record. He barely missed out on being selected the Small College Coach of the Year, when the team went undefeated. He has been installed in the Sewanee Hall of Fame. 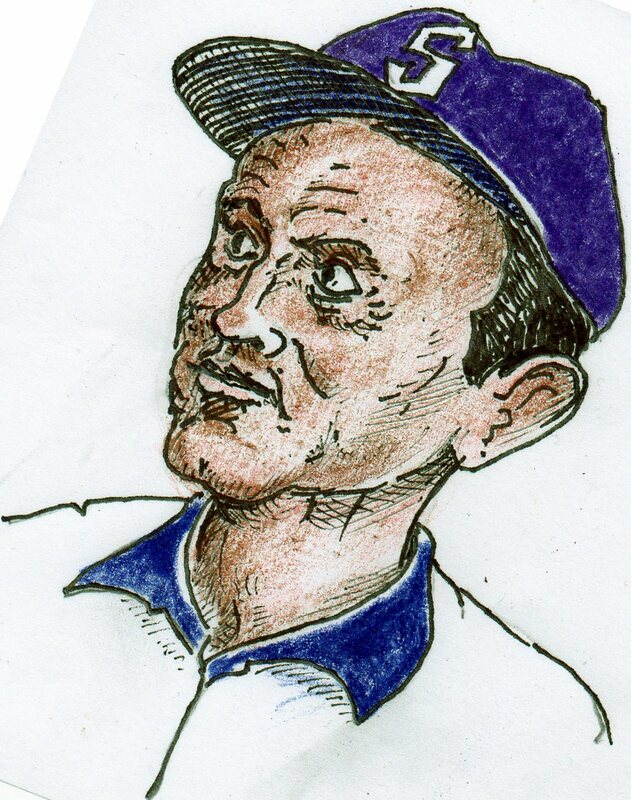 He was the Shogun of the Majors Football Dynasty, which should impress you SEC historians. Suffice it to say the name Majors is synonymous with strong character and football savvy in the canon of Southern Football. Listen, I know it’s hard being a coach. I coached my son’s 6th and 7th grade basketball teams. There were times I definitely felt like spitting on the kids, but you have to draw the line somewhere. I guess I don’t have what it takes to be a coach either.